Besides the internal improvements and new functions in present in the 80286, the 80286 also features a full 16 bit data path to the system. To take advantage of the improved data path the PC bus was extended. 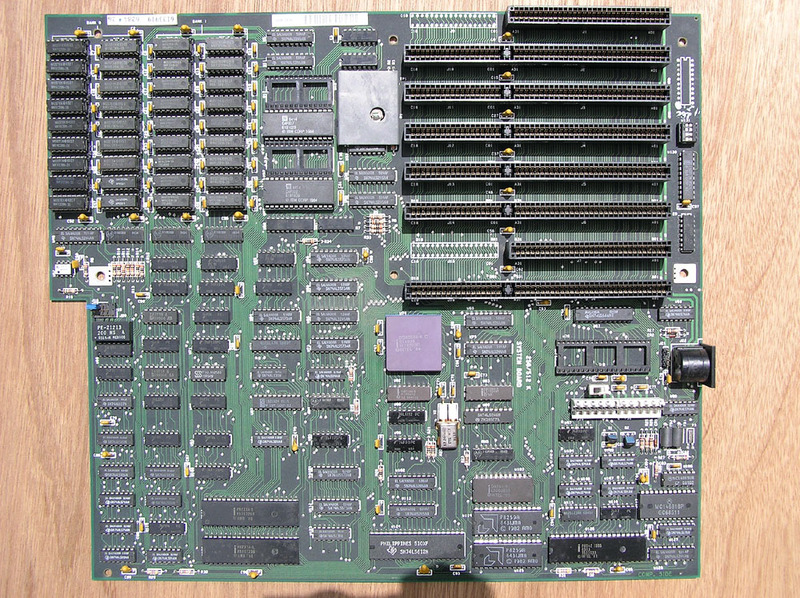 The original 62 pin card-edge socket for the PC bus is present in all slots, allowing many cards designed for the IBM PC 5150 to be reused. Six of the slots also feature an 36 pin card-edge socket which provides the additional data and control signals required for the enhanced bus. Fitted to 5170 model 239. The type 2 motherboard is physically smaller than the type 1 motherboard. BIOS ROMs dated 06/10/85. 6 MHz operation. The math coprocessor used on the IBM 5170 motherboard is the 80287. It is optional. Only programs that are written to utilise a math coprocessor gain any benefit from the presence of a math coprocessor. On the 5170 motherboard, the CKM pin of the 80287 is tied low, thus dividing the supplied clock frequency by three. For all three types of motherboards, the 80287-6 (i.e. rated at 6 MHz) is the most appropriate rated 80287. If required, an 80287-8 (i.e. rated at 8 MHz) or an 80287-10 (i.e. rated at 10 MHz) can be used, however, compared to the 80287-6, there is no performance benefit. 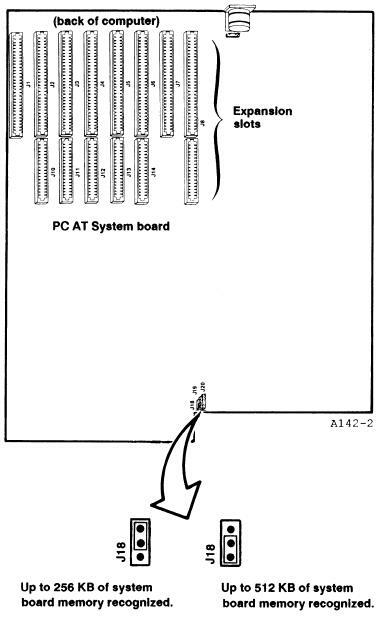 On a type 1 motherboard, either the first bank (bank 0) is populated, or both banks (banks 0 and 1) are populated. When adjusting a type 1 motherboard between the two configurations, jumper J18 on the motherboard also needs to be adjusted (see 'Motherboard switch/jumper settings' section following). On a type 1 motherboard, a failure of any chip in the first bank of RAM (bank 0) results in what appears to be a 'dead' motherboard. See Reference 6 for details of diagnosis. Type 2 and type 3 motherboards have 2 rows of RAM sockets. 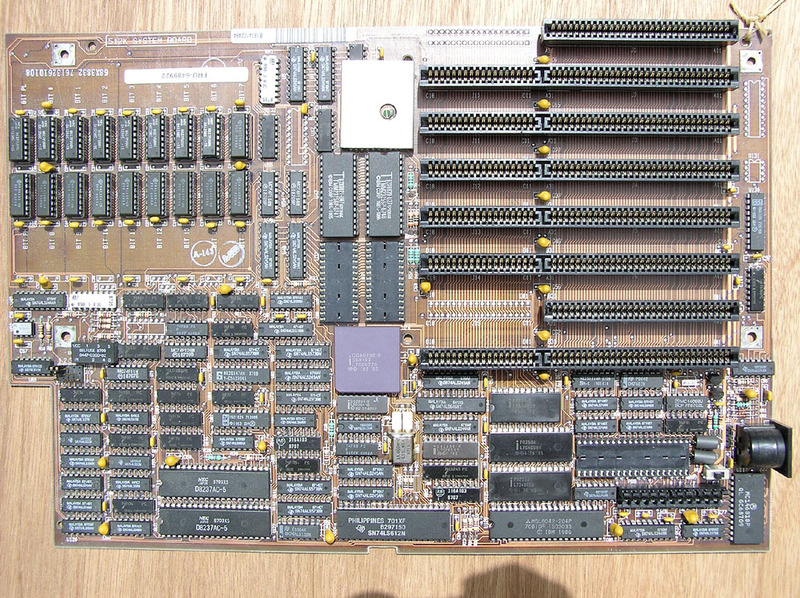 The 2 rows hold one bank of RAM, with the bank being 512KB sized and consisting of eighteen 256Kbit RAM chips (16 data bits + 2 parity bits). On these types of motherboards, a failure of any of the RAM chips results in what appears to be a 'dead' motherboard. See Reference 6 for details of diagnosis. Motherboard chips U27 and U47 are the BIOS ROMs, although technically speaking, besides the BIOS, they also contain the POST (Power On Self Test) and BASIC. Both BIOS ROMs are 32KB sized, of type 27256. The speed specification is 150nS or faster [page 1-11 of Reference 3]. They are 8-bit ROMs supplying 8-bit data to a 16-bit data bus. U27 supplies the lower 8 bits of the 16 bits and U47 supplies the upper 8 bits of the 16 bits. As a result, the bytes from U27 appear at even addresses, and the bytes from U47 appear at odd addresses. In the 5170 memory map, their combined output appears at addresses F0000 (960K) through to FFFFF (1024K-1). More details of the BIOS ROMs are at Reference 5. Motherboard sockets U17 and U37 are empty, available to be populated by ROMs, if desired. Like the BIOS ROMs, they are to be of type 27256 (with speed of 150nS or faster), and like the BIOS ROMs, they are 8-bit ROMs supplying 8-bit data to a 16-bit data bus. U17 supplies the lower 8 bits of the 16 bits and U37 supplies the upper 8 bits of the 16 bits. As a result, the bytes from U17 appear at even addresses, and the bytes from U37 appear at odd addresses. In the 5170 memory map, their combined output appears at addresses E0000 (896K) through to EFFFF (960K-1). Motherboard chip U72 is also a ROM - used in the generation of RAS and CAS signals for the RAM. 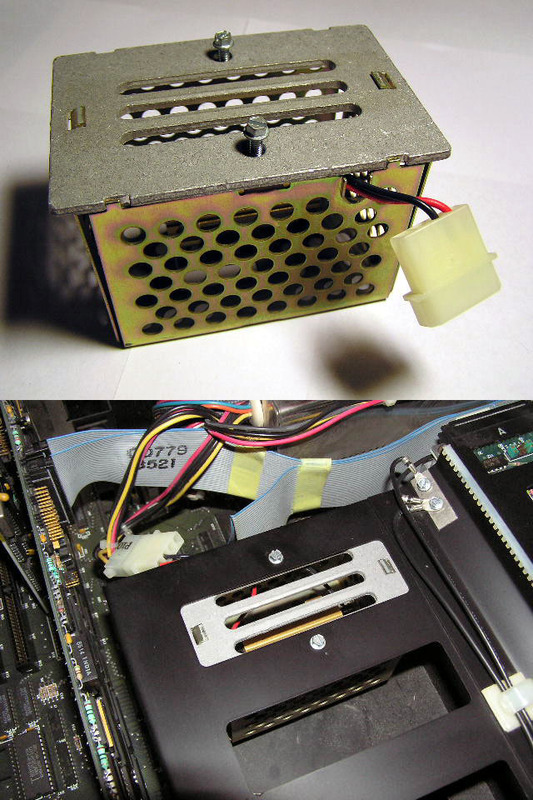 The 20MB hard drive initially supplied in model 099 machines was made by Computer Memories Incorporated (CMI). The CMI drive was a CMI model 6426 [Reference 1]. The CMI sourced drives were very unreliable and most were replaced under warranty. The generally accepted (but not proven) theory for the failures is that CMI was a small manufacturer that was not able to handle the ramp-up in production needed to supply IBM with hard drives, and thus quality control suffered. Alternative explanations include a defect that caused a slow erasure of the servo platter [Reference 2]. The later supplied 20MB drive was a Seagate ST-4026. Both drives are full height and are of IBM type 2. In these later 5170 models, IBM supplied 30MB drives. They are the Seagate ST-4038 and IBM 0665-38. Both drives are full height and are of IBM type 20. The BIOS on the motherboard of these later models (BIOS dated either 06/10/85 or 11/15/85) is enhanced to support a type 20 drive. An alternate method is to use software that contains low-level formatting functionality, e.g. SpeedStor. NOTE: The 'G=C800:x' method that is typically used for hard disk controllers in PCs and XTs, will not work for the IBM supplied controller in the 5170. IBM used a default sector interleave of 3:1 in the 5170 hard drives. Changing that to 2:1 results in better overall performance of the hard drive system. The interleave can be specified at the time of low-level formatting. If the hard drive is already in use, special software (such as SpinRite II) can perform a non-destructive change of sector interleave (non-destructive: won't delete programs/data that are presently on the drive). Adjacent to the power connectors is a small switch. It is set according to the primary display adapter. J18 is set according to whether the motherboard is to decode 256KB or 512KB of motherboard RAM. Refer to the diagram at this link for the setting of J18. On a type 1 motherboard, J18 is set according to whether bank 0 only is populated (i.e. 256KB), or whether both banks 0 and 1 are populated (i.e. 512KB). 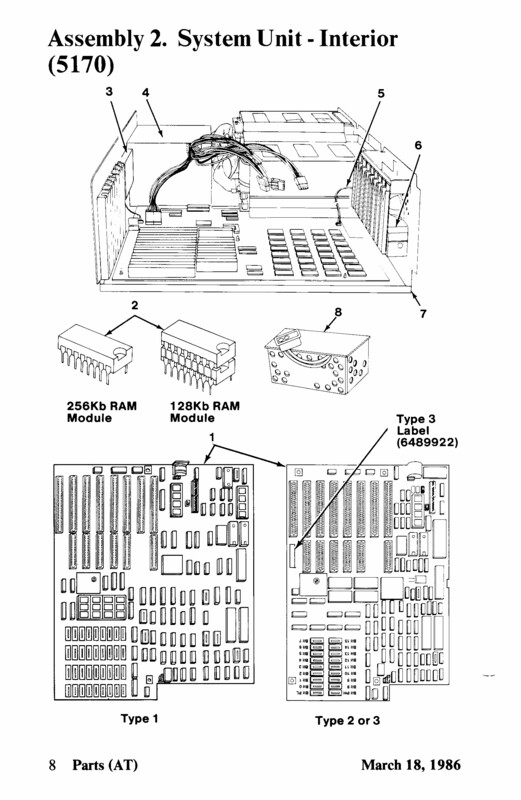 On type 2 and 3 motherboards, J18 is normally set to the 512KB position, since there is only one motherboard RAM configuration. If J18 is set to the 256KB position, only the first half of each RAM chip will be used. Being a standard Lithium battery, it is not rechargeable. The first sign of a low battery is that the 5170 starts to lose time. As the battery voltage gets lower, the rate of time loss increases. Eventually, the battery voltage gets low enough to trigger the 5170 to generate a 161 or 162 or 163 error on power up. 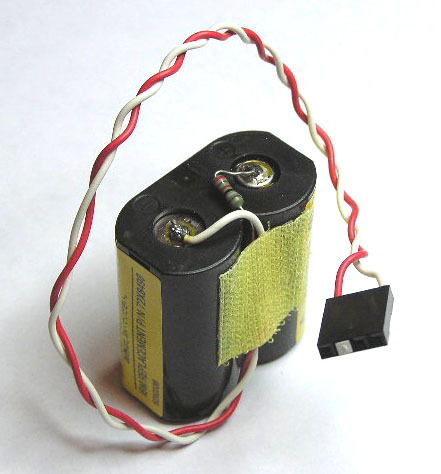 A 3 volt Lithium battery is inadequate. It will cause loss of time. Many 5170s are fitted with a 3.6 volt Lithium battery (photo of similar item). 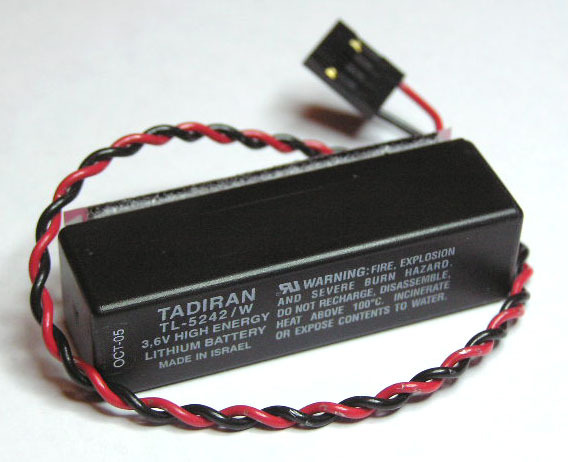 Reference 10 suggests that even a new 3.6 volt Lithium battery may result in time loss in some 5170s. The 5170 motherboard does not contain battery charging circuitry, and so any rechargeable battery connected will not be charged by the motherboard. The IBM AT keyboard is the first bi-directional keyboard in the PC family. Bi-directional refers to the capability of the keyboard to both send data and receive it. Being able to receive data allows the system unit to accurately set the keyboard indicator lights to match their actual state, a feature that was not possible on the earlier members of the PC family. There are two possible keyboards for the IBM AT - an 84 key keyboard and a 101 key enhanced keyboard. Models 068, 099, 239 and 319 use the 84 key keyboard. Model 339 is the only model that was supplied with a 101 key keyboard. That keyboard may also be used on Model 319. That keyboard is not supported on the other models (due to motherboard BIOS and possibly code in keyboard controller chip). J18 is set according to whether the motherboard is to decode 256KB or 512KB of motherboard RAM. If a type 1 motherboard has only 256KB fitted, and J18 is incorrectly set to the 512KB position, you'll find that the IBM AT will boot. However, if a memory expansion card is then fitted that provides RAM between addresses 256K and 512K, memory errors between the addresses of 256K and 512K may occur (because data bus contention will occur as a result of address conflict). IBM's '512KB/2MB Memory Expansion Option' card is designed for the later models of the IBM AT. 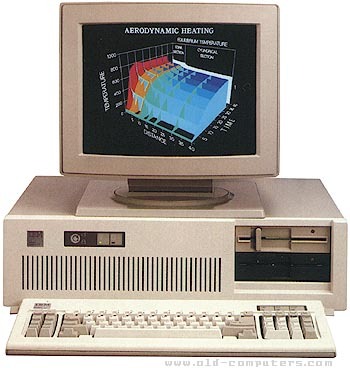 If it is used in a model 068/099 that also has an IBM EGA card fitted, a PARITY CHECK 2 error will be seen on warm boot of the IBM AT. There are various editions of those 5170 manuals. See Reference 9 for details. 5150, 5160, S9000, 5155 all pre-dated the AT. Indeed they did, but the AT was by far the most innovative.